Whitewater trips down the Chattahoochee River, on a course almost two miles long billed as the "Longest Urban Whitewater Course in the World", will start Memorial Weekend, 25–27 May, months earlier than the previous announced date of mid-August. The rafting trips conclude in downtown Phenix City, where the river runs past the twin cities of Phenix City, Alabama and Columbus, Georgia. Both cities are having events May 25–27 along their riverwalks and downtowns to highlight the whitewater course. As a result of the new start date the whitewater outfitter in Phenix City, Whitewater Express, has now started taking group reservations. 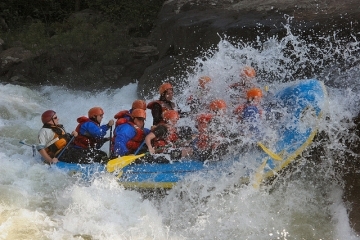 Prices for rafting trips are soon to be announced. The unique whitewater experience is all part of multi-million dollar projects that included re-engineering the river, completion of riverwalks and a pedestrian bridge over the river. The new tourism experience includes whitewater rafting, kayaking, and river surfing.